We bring you a map of survival that becomes a mixture in a World in a Jar Map and Sky Block Survival Map. 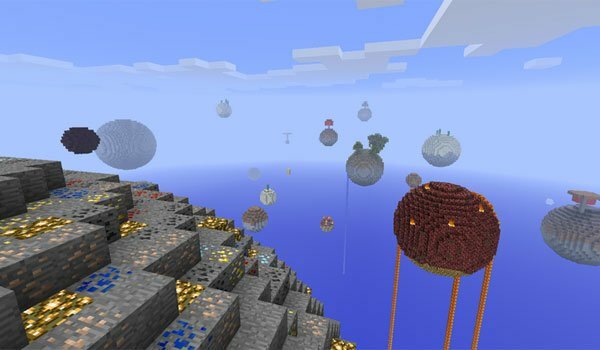 Sky Islands Map 1.5.1 gives us a world with 25 areas or islands (round) or floating biomes representing specific areas, for example there are areas with dungeons, for the Nether, resources areas, areas with animals, etc.. Create a trap for mobs in a dungeon. Create a farm of experience in the dungeon. Getting make 10 blue wool, red, orange, yellow, gray, black, green, cyan, pink and white. Travel to The End and kill the Ender Dragon. Enchant something with all your experience. Reach paradise (see image below). How to install Sky Islands Map for Minecraft 1.5.1? Survive in a world of giant floating balls!